Found her on the 1920 Campbell, Hunt, Texas census (dist 135 img 15) as Almeida Finger age 49. Found her on the 1930 Precinct 4, Hunt, Texas census (dist 24 img 17) as Almeda J. Finger age 59. Found her on the 1900 New Haven, New Haven, Connecticut census (dist 365 img 16) age 29. Found her on the 1910 New Haven, New Haven, Connecticut census (dist 398 img 29) age 40. Found him on the 1850 Milan, Dutchess, New York census (img 33) age 40, laborer, living with his parents. Found him on the 1860 Milan, Dutchess, New York census (img 33) age 52, living with his parents. Found him on the 1860 Blount, Tennessee census (dist 8 img 4) as Abel Carpenter age 37, farmer. Found her on the 1930 Maiden, Catawba, North Carolina census (dist 22 img 15) age 7. Found him on the 1900 Lower Fork, Burke, North Carolina census (dist 12 img 19) as Robert B. Denton age 1. Found him on the 1920 Brookford, Catawba, North Carolina census (dist 36 img 9) as Below Denton age 20, single, living at home. Laborer, cotton mill. The North Carolina Birth Index shows a delayed entry for his birth as 30 Jan 1898, but we have opted to use the year shown on the 1900 census, 1899, which is within 1 year of his birth. Aaron L. Finger, 87, passed away November 16, 1993 at his home in Fort Worth, Texas. Mr. Finger was co-owner of Finger Furniture Company, along with his brother Sammy Finger. Aaron Finger was the second of six children born to the late Sam and Annie Finger in Shephard, Texas, on March 17, 1906. At an early age, Aaron went into business with his older brother Hyman in Daisetta, Texas. 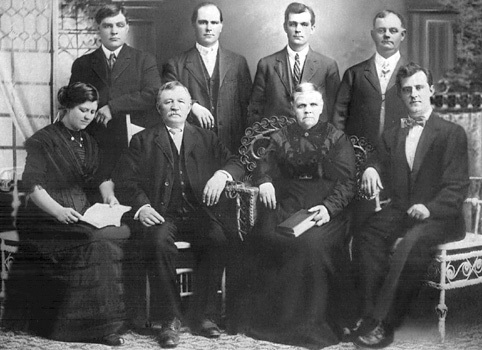 In 1936, Aaron moved to Houston to join his father and brother in the furniture business. In 1962, he moved to Fort Worth where he established Finger Furniture Company. He belonged to the Elks Club and Scottish Rite. He was a Shriner and a Thirty-second Degree mason. Mr. Finger received the Human Relation Award in Chicago from the American Jewish Committee in 1984. He also received the Johnny Shilling Special Friendship Award in Dallas in 1989. He belonged to the Ahavath Shalom Synagogue of Fort Worth and Beth Yeshurun Synagogue of Houston. Mr. Finger resided in Fort Worth with his wife Pat. Survivors: Wife, Pat Finger of Fort Worth, children, Relda Finger Hoffer, Alan and Marlene Finger, both of Houston. Grandchildren: Pamela Hoffer, Wendy and Ira Bleiweiss, Scott and Gayle Hoffer, Steve and Mindy Finger, Bradley Finger all of Houston, Bruce and Carey Hoffer of Beaumont and Melanie and Peter Goldstein of Seattle, WA and 15 great-grandchildren. Two brothers, Bernice Finger and wife Sarah and Sammy Finger and wife, Florence. Two sisters, Rosetta Glick and Aline Kost and husband Joe, all of Houston. Found him on the 1910 Justice Precinct 1, San Jacinto, Texas census (dist 101 img 13) as Aaron Finger age 3. Found him on the 1920 Justice Precinct 2, San Jacinto, Texas census (dist 133 img 16) as Aaron Finger age 13. Found him on the 1930 Precinct 7, Liberty, Texas census (dist 27 img 37) as Aaron L. Finger age 22. Merchant, dry goods. Found him on the 1940 Houston, Harris, Texas census (dist 258-259 img 17) as Aaron L. Finger age 34. Sales Mgr, Retail Furniture Co.
Found her on the 1880 Meramec, Jefferson, Missouri census (dist 196 img 2) as Ann C. Finger age 8. Found him on the 1900 Marissa, St. Clair, Illinois census (dist 115 img 1) age 7. Found him on the 1930 Marissa, St. Clair, Illinois census (dist 83 img 26) age 36, married, funeral director. Kenneth "Kenny" Blair FINGER Jr.
|--Kenneth "Kenny" Blair FINGER Jr. He is referred to as Kenny Finger in his father's obituary. 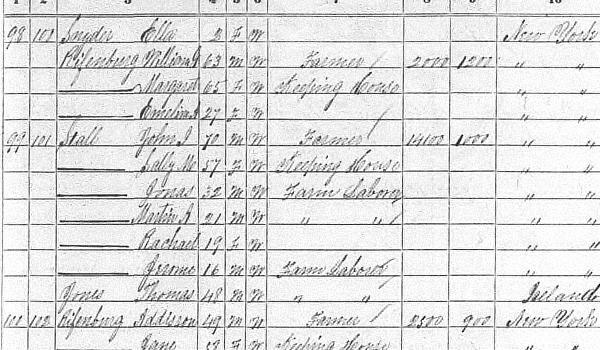 Found her on the 1900 Fountain, Juneau, Wisconsin census (dist 75 img 5) age 8. Found her on the 1920 Fountain, Juneau, Wisconsin census (dist 67 img 2) age 27, single, living at home. Found him on the 1920 New Haven Ward 13, New Haven, Connecticut census (dist 401 img 11) as Gilbert F. Greene age 5. Found her on the 1930 New Haven, New Haven, Connecticut census (dist 95 img 37) as Gilbert Green age 16. Found him on the 1930 Berwyn, Cook, Illinois census (dist 1987 img 26) as Paul Guttke age 57. Janitor, private home. Found her on the 1940 West Allis, Milwaukee, Wisconsin census (dist 40-91 img 45) as Doris Hochmuth age 11. Found her on the 1900 Maple Creek, Outagamie, Wisconsin census (dist 91 img 8) as Oral Kempf age 17. Found her on the 1905 Maple Creek, Outagamie, Wisconsin state census (img 1) as Oral Kempf age 22, single, living at home. Found her on the 1910 Maple Creek, Outagamie, Wisconsin census (dist 144 img 6) as Oral Kempf age 26, single, living at home. Found her on the 1920 Lebanon, Waupaca, Wisconsin census (dist 139 img 7) as Orell Bublotz age 38. No children. Found her on the 1930 Lebanon, Waupaca, Wisconsin census (dist 20 img 4) as Orell Bublotz age 48. Found her on the 1880 Gallatin, Columbia, New York census (dist 10 img 13) as Mary Kilmer age 6. Found her on the 1910 Red Hook, Dutchess, New York census (dist 81 img 27) as Mary C. Brenzel age 36. Has given birth to 5 children, 5 are living. Found her on the 1920 Red Hook, Dutchess, New York census (dist 71 img 10) as Mary C. Brenzel age 46. Found him on the 1920 Albany Ward 1, Albany, New York census (dist 5 img 12) as Paul J. Mathews age 25, single, living at home. Found him on the 1930 Albany, Albany, New York census (dist 82 img 77) as Paul Matthews age 37, druggest, drug store. His mother-in-law Hattie Boutau age 52, widow, is living in his household. Found her on the 1920 Jackson, Elkhart, Indiana census (img 6) age 38, single, living with her father. Found him on the 1900 Germantown, Columbia, New York census (dist 13 img 21) age 64, widower, living with his daughter and son-in-law, Adam and Mary Proper. Mrs. Betty Moss Tears, daughter of Mr. and Mrs. Robert Moss, of Guyanoga, has received word that her husband, Staff Sergeant Howard I. Tears, son of Mr. and Mrs. Ernest Tears, of Benton, was reported missing in action April 23. Sgt. Tears was a gunner on a Fortress flying from a base in Italy. Graduate of Penn Yan Academy, Sgt Tears was employed in the Mercury Aircraft plant at Hammondsport when he was called to service in February 1943. - Penn Yan Democrat May 26, 1944. Found her on the 1940 Jerusalem, Yates, New York census (dist 62-12 img 14) as Betty Tears age 20. Found her on the 1850 Saugerties, Ulster, New York census (img146) age 15. See notes for her 2nd husband Johannes FINGER. Her family name may not have been NOLL. Her father may not have been Thielemann NOLL. He served in the Civil War, as a private in Company F, 179 NY Volunteer Infantry. He enlisted March 25, 1864 and was discharged June 10, 1865. He received an invalid pension for 'gunshot wound of cranium.' He was wounded June 18, 1864 at Petersburg, Virginia. "While engaged in battle with the rebels he was in front of Petersburgh in Virginia on said 17th day of June 1864 he was wounded on the right side of the head by a piece of shell" - affidavit of David A. Bradley, First Lieutenant of Co. F.
Found him on the 1880 Benton, Yates, New York census (dist 215 img 3) as Charles C. Owen age 46, farmer. Found him on the 1900 Benton, Yates, New York census (dist 134 img 14) as Charles C. Owen 66, farmer. Father born New York, mother born Pennsylvania. He and his family are living next to his wife's brother William R. Finger age 46 and his family. She is listed as Cora K Rhyne on the birth index listing of her son Robert. Found her on the 1920 Moores, Blount, Alabama census (dist 3 img 4) as Susie Robinson age 8. Found her on the 1930 Moores, Blount, Alabama census (dist 3 img 4) as Susie S. Robinson age 17. Found him on the 1880 Salina, Onondaga, New York census (dist 194 img 6) as Casper Sthiasser age 37, farmer. Found him on the 1900 Salina, Onondaga, New York census (dist 76 img 20) age 56, gardner. Year of immigration, 1874. Found her on the 1875 Chatham, Columbia, New York state census (E.D.01 img 26) as Rachael Smith age 40. Found him on the 1850 Clermont, Columbia, New York census (img 10) as Alton H. Stall age 1. Found him on the 1875 Clermont, Columbia, New York state census (img 1) as Martin Stall age 26. He is single and living at home. Found him on the 1880 Clermont, Columbia, New York census, age 31, farm laborer. Found him on the 1900 Clermont, Columbia, New York census (dist 10 img 14) age 51, farmer. Found him on the 1860 Newton, Catawba, North Carolina census (img 4) age 11. Found him on the 1850 District 4, Bedford, Tennessee census (img 11) age 9. Found him on the 1860 Conway, Izard, Arkansas census (dist 2 img 2) age 17.